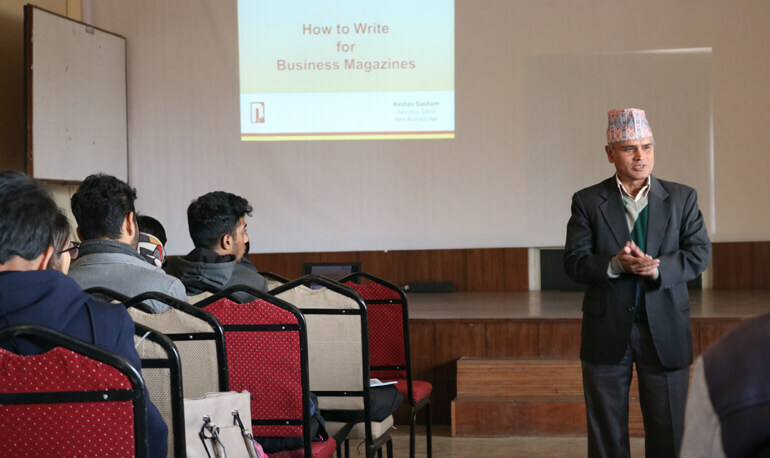 Mr. Keshav Ghimire, an Executive Editor at New Business Age Pvt Ltd conducted a session where he motivated young generation to involve in writing business articles. The workshop was conducted on 27th November, 2016 which was attended by the batch of 2014-16. He briefly talked about the practices of writing a review on business article or any ongoing movements in and across the country. Further, he gave aninsight about the do's and don'ts while writing a good article. The students were introduced about the five para rules which consisted of an introduction, three main body parts and a conclusion. As the readers were more attracted to the conclusions, he suggested to start writingan article with a conclusion rather than an introduction. All in all, the session was quite informative and motivating to the students where they could see using his ideas and lessons in their future article write ups.